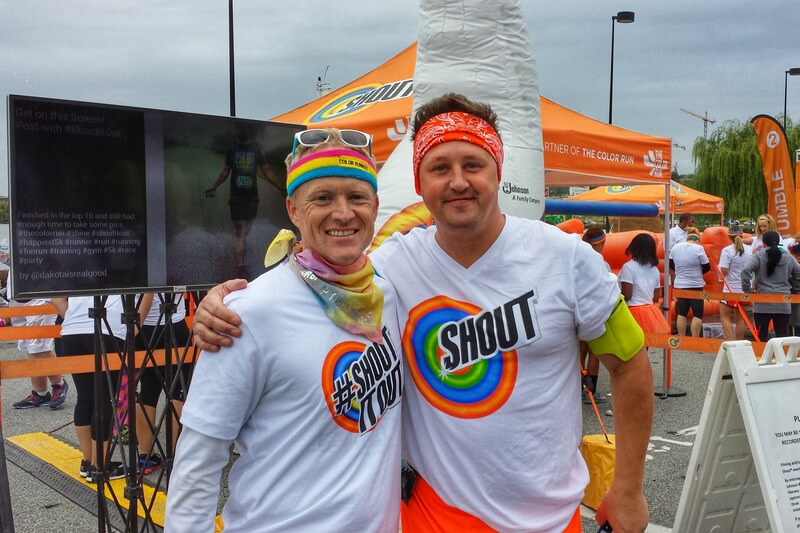 If you dial back a few weeks and read my last post, you’ll remember Shout® showing up at my digital doorstep to pull me out of my partial running retirement. 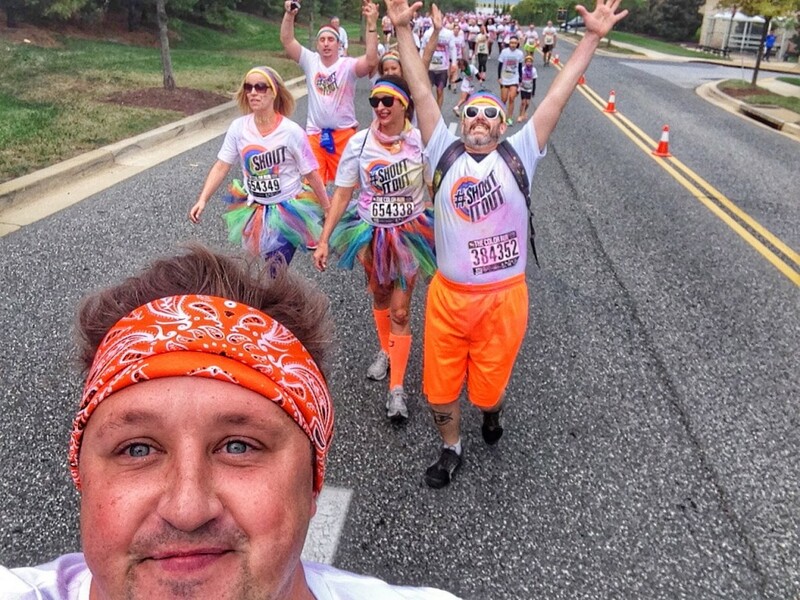 They challenged me to put together an 11-person team to represent Team Shout® and participate in The Color Run™ in Washington D.C. for the 2015 Shine Tour. 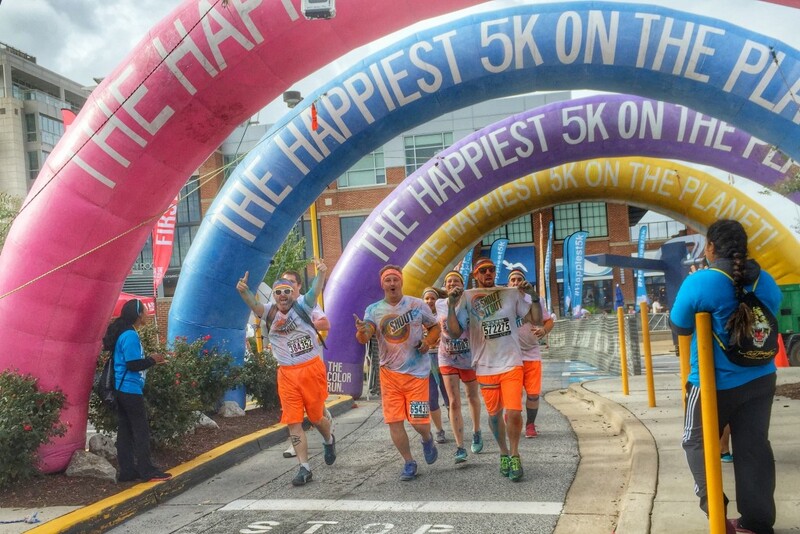 Labeled ‘The Happiest 5k on the Planet’, The Color Run™ isn’t a timed event, it’s more of a fun run aimed at getting people outside, exercising while having fun and feeling happy and healthy. If you’ve never run one of these, I can personally assure you that they hit the nail on the head. With 11 race packages delivered, the week before the race I found myself scrambling to get in shape. I got a few runs in, stretched the hammies on my front lawn with my neighbors honking on their way to work as I nodded, doubled over and wheezing. I could do this, I told myself, no problem. The drive to National Harbor was smooth as silk (completely unexpected for the Capitol Beltway) and Shout® had arranged for us to park close to the starting line. 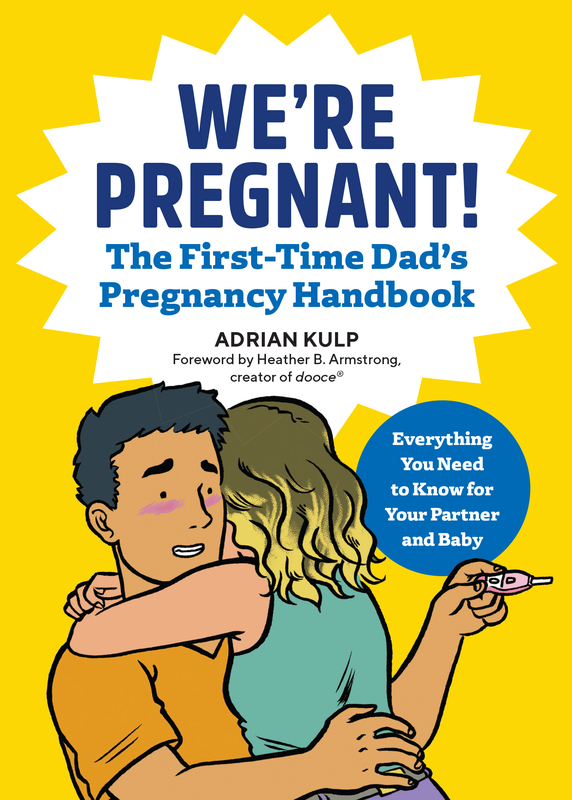 We all gathered at the giant orange tent with the inflatable moving Shout® maze next to the festival stage, where a DJ was leading a Zumba warm-up sesh, while firing a t-shirt gun into the masses. It was only two years ago that my friend Andrew and I had finished the Ragnar Relay a few hundred yards from where we were standing. We smiled and reminisced, but only after he told me that our team was possibly there to represent the geriatrics and that he was confident we had single-handedly raised the average age of participants. 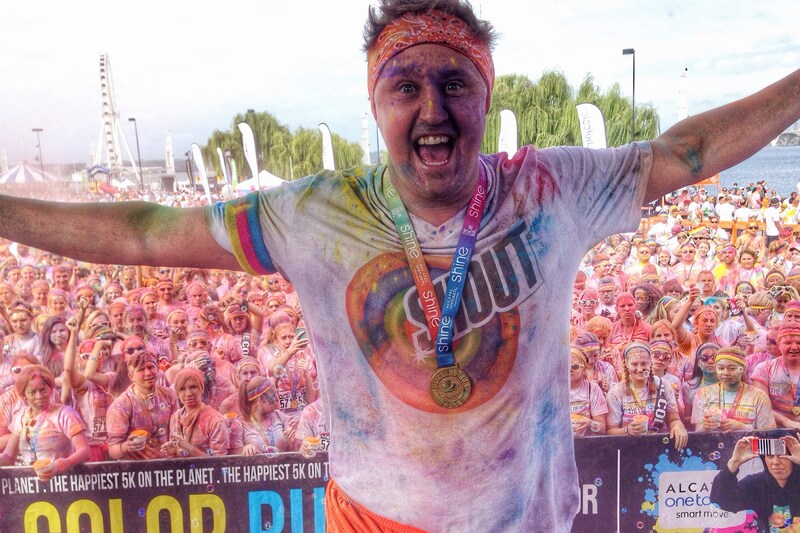 As we laughed, I looked around at the crowd of almost 5,000 people who turned up to run, noticing a wide array of young and old – out to have fun. 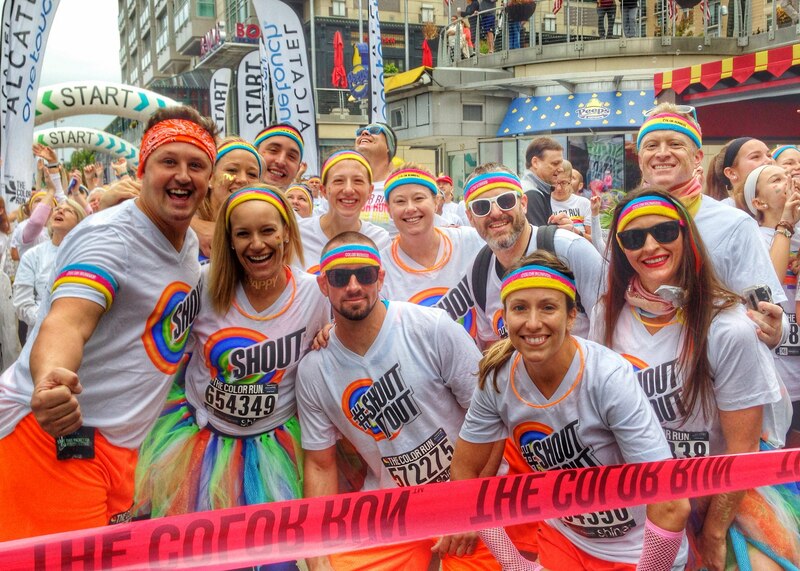 Before we officially started the race, it was revealed that our team would have the honor of taking the stage at the close of the run and leading the color mob in the orange color throw – very appropriate. 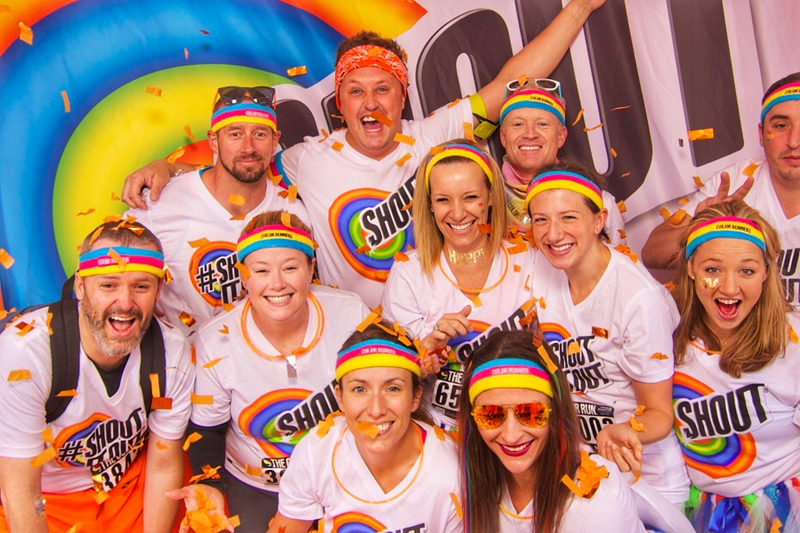 We huddled up together and took some ‘before’ pictures in the Shout® glitter booth. As I mentioned, this run wasn’t officially timed, however, there was still a little bit of residual pressure to not take a dirt nap and end up in an ambulance halfway into a 5k. 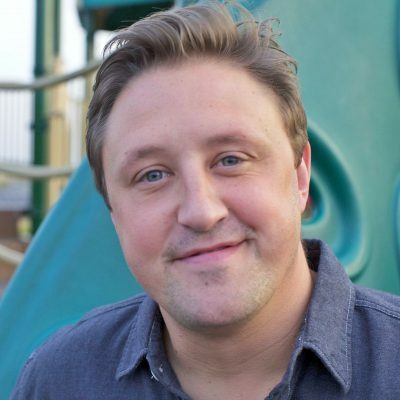 How would I feel if I got hosed by a gang of 10-year-olds (this happened) that sprinted the entire thing? As we were led to the starting line, the music was pumping an air of excitement that kinda gave me the chills. Everyone was smiling and laughing and removed their hats, with hands over hearts as a race rep waved our nation’s flag over the crowd and we sang The National Anthem in unison. The starting tape was removed and the countdown began. 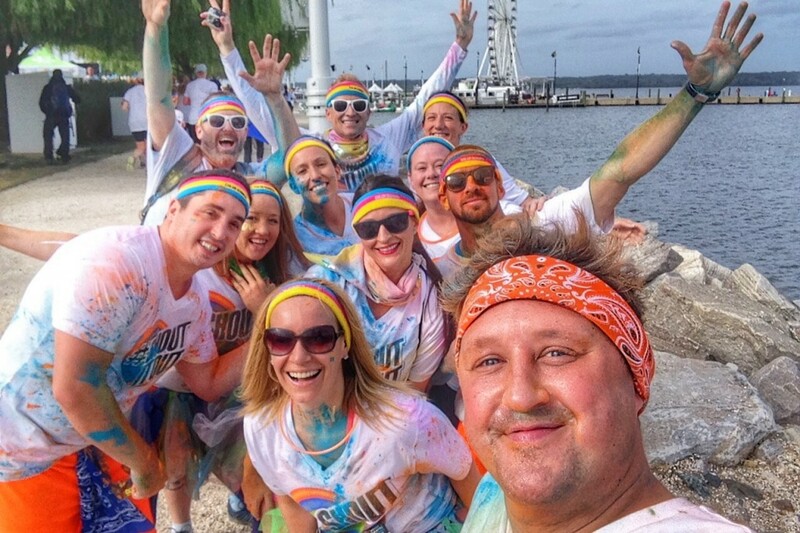 We took off following a golf cart blaring music and came up on the first color station – overlooking the harbor. 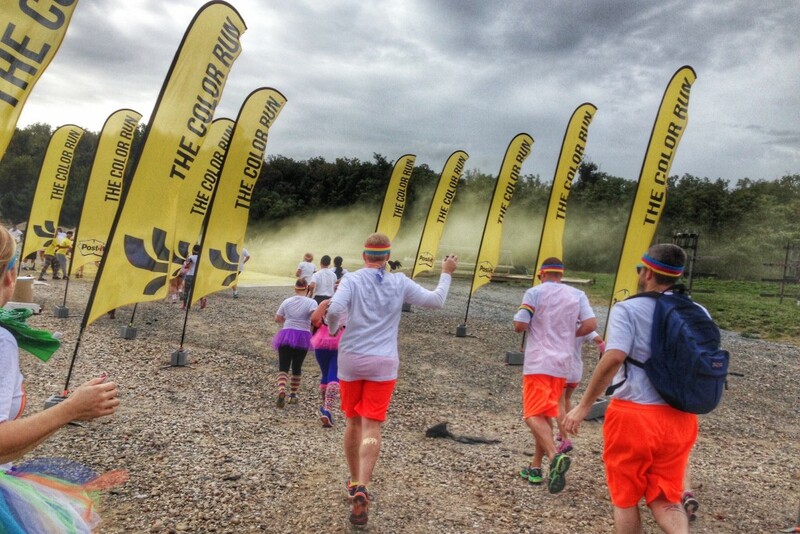 As we entered the color gauntlets, I wondered what my strategy might be. 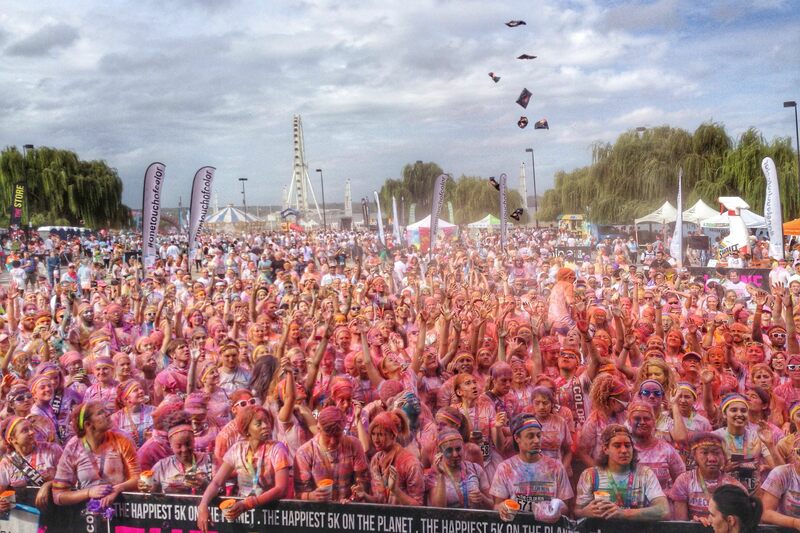 Would I hold my breath and full-on sprint past a dozen people spraying me with colored powder? Or would I take my time, spin and dance for amplified exposure? 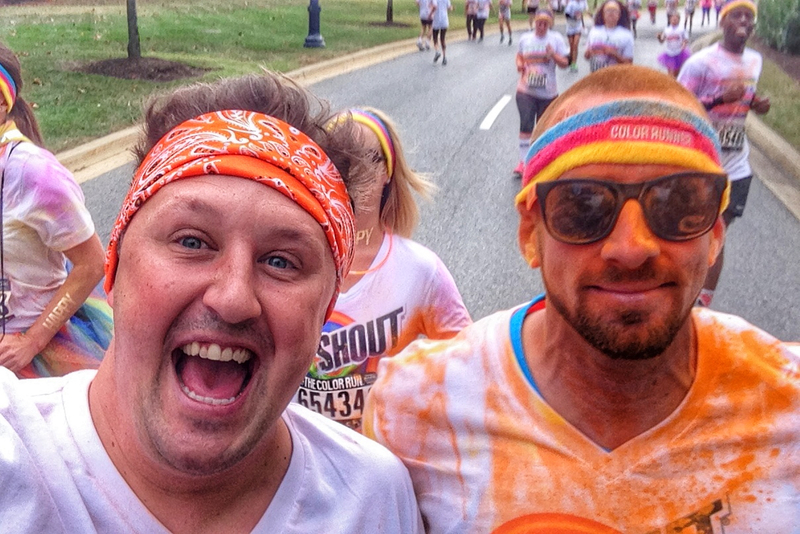 I wasn’t worried about the white shirt – Shout® stain removers had me covered. Or would I do what my teammate, Iggy, did and literally lie down and roll through the color stations. I have to say, there was something really enjoyable about this whole thing – music pumping at the color stations, running through bubble machines and the overall positive attitude of everyone around us. As we came down the final stretch, we emerged from a blue cloud of dust to run, once again, alongside the harbor and started to see runners congregate in front of the stage. 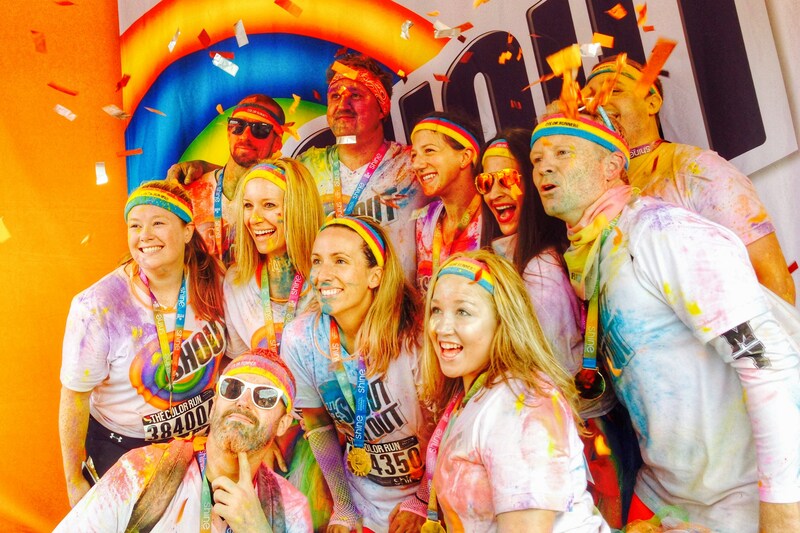 …we revisited the glitter booth – this time with a little more color. I could’ve done without it in between my teeth. …covered from head to toe in vibrant hues as we took the stage and led them in an explosion of orange, reigning from the stage above. My team was comprised of family, friends and people I’ve only met once or twice, but in the end we all left kinda feeling like family. We had an experience together… we laughed, smiled and even sweat a bit. As we walked away from the groups gathering to take mid-air jumping photos and parades of revelers with selfie-sticks, we hit the Shout® Clean Zone, where a dude with a leaf blower backpack almost took my shorts off. I thought the emphasis was on removing stains, not pants. 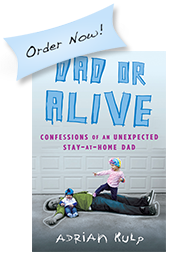 Team Dad or Alive aka Team Shout® aligned to conquer, but also divide and head home, to use Shout® Trigger Triple-Acting Stain Remover and Shout® Color Catcher® to fight one of the many new generations of stains. Now the question is, how long will I be pulling orange q-tips from my ears? 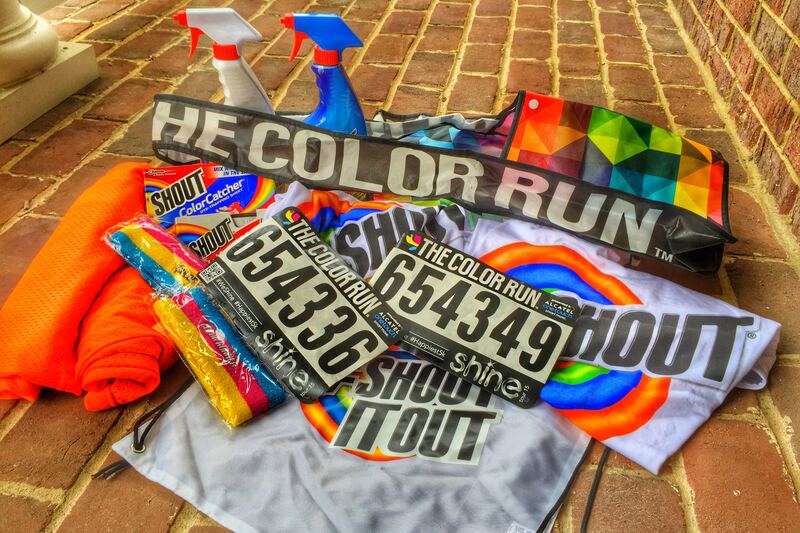 Learn more about Shout® and their stain-fighting power by checking out their website, ShoutItOut.com, and engage with Shout® on Facebook, Twitter and Instagram by using the hashtag #ShoutItOut. « Autumn, Please Don’t Go, Baby. I Want You to Stay Forever.